This issue explores how to harness powerful new information technologies––particularly the internet––to strengthen fundraising, and it examines the ethical issues raised by the extraordinary potential of these technologies. The contributors argue that nonprofits may have to develop revolutionary new institutional structures in order to take the fullest advantageof these new tools, while at the same time taking care not to abuse the expanded information–gathering and outreach capabilities now available to them. Chapters use a case study to show how to constructa web page that compellingly reflects an organization′s mission and purpose, and how to avoid common mistakes when chosing fundraising software. The contributors draw on current fundraising regulations to offer a model for regulating internet fundraising practices, discuss whether existing guidlines for gathering information on donors and potential donors are still applicable in the new technological environment, and challenge nonprofits to use technology to bridge the gap between the haves and have–nots. This is the 25th issue of the quarterly journalNew Directions for Philanthropic Fundraising. A difference that makes a difference (J. GetzAndanner). Communication, acknowledgment, and the morality of cyberspace (M. Hyde & A. Mitra). The Internet and the regulation of the nonprofit sector (M. Johnston). Buy versus build: Picking fundraising software for your organization (T. Mills–Groninger). 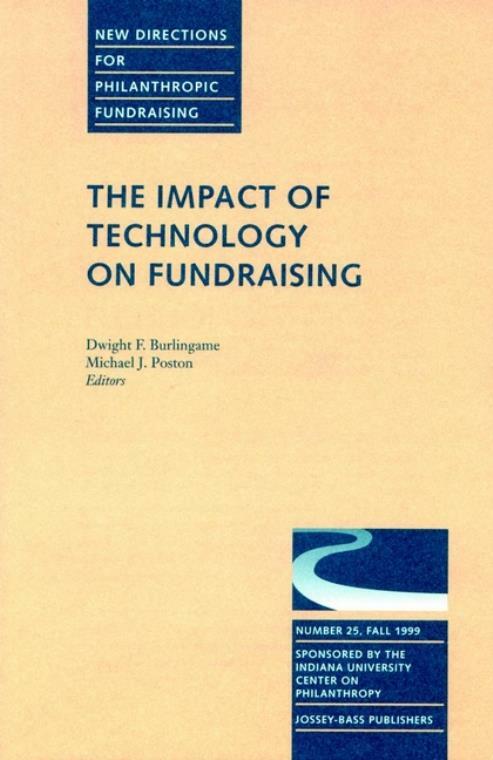 The effects of technological advances on the ethics of gathering information in support of fundraising (C. Pulawski). Philanthropy and the digital revolution (C. Smith).